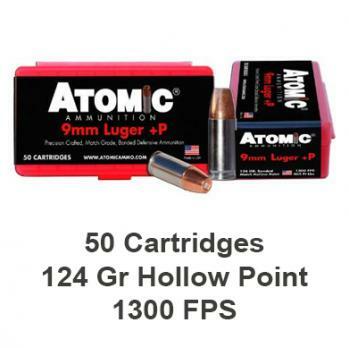 Atomic’s 380 ACP ammunition is designed to hit hard, expand to 150% of its original diameter even if fired through heavy clothing and still penetrate 12 inches or more of ballistic medium and all when fired from a small, concealed carry sized pistol. At Atomic Ammunition we know that you carry and use real guns, not test barrels. All of our external ballistic information is obtained from tests using common firearms that you are likely to own and use, not inflated, misleading information from test barrels. We feel that this is the most accurate and useful information for our customers, so it is the only information that we provide. Assembled to exact specifications with commercial grade machinery ATOMIC AMMUNITION is designed to deliver the accuracy that precision shooters demand and do it all at a price that you can afford. For your safety we follow SAAMI recommended guidelines and each round is precision crafted, match grade and individually inspected at our factory in the United States by skilled professionals before it ever leaves our doors. To further quantify this, we have utilized three independent testing laboratories in the U.S. to safely develop our products.